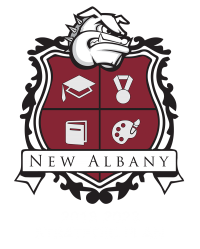 The New Albany School District serves students in all facets of giftedness. Intellectually gifted services are offered grades 2-8. Artistically and Creatively gifted services are offered in grades 7-12, and Academically gifted classes are offered in grades 9-12. A process has been developed for the referral and evaluation of students for these programs. A referral can be made by a teacher, administrator, parent or student. Referrals can be made to the Office of Special Services at (662) 534-1802.